In addition to outflow from the central crater, lava can also flow from vents and fissures around the sides and edges of the main volcano. As a fissure eruption progresses, the outflow tends to become localized to one or a few spots along the fissure. These spots tend to build up small cones, often referred to as parasitic cones. These parasitic cones are generally of two types: spatter cones and tuff cones. A good example of spatter cones are those seen on Isla Bartolomé, adjacent to the large island of Santiago. As magma flows out of the vent, dissolved gasses are released, often causing gobbets of lava (de-gassed magma) to be tossed up into the air. These gobbets cool and semi-solidify in the air, and then fall back and land in "splats" to eventually form a small cone. Tuff cones tend to be found at the water's edge or just off shore. Tuff is a rock composed of extremely fine-grained volcanic ash cemented together. It was cones like these that Darwin found most interesting, and it was Darwin who first explained how they are formed. Such cones are formed by what we now call a phreatomagmatic eruption. When sea water enters into the vent and contacts the magma, it flashes to steam and explodes upward. The explosion carries with it magma that has been fractured into droplets that form very tiny fragments. These fall back around the vent to form tuff. This tuff is often later chemically modified to a yellowish mineral called palagonite. 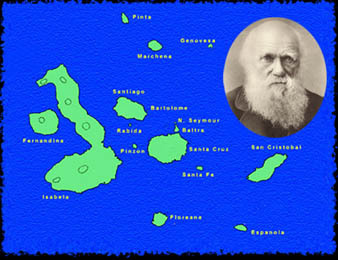 Darwin also noted that southeast rims of many tuff cones are low. This, he believed, was due to the trade winds which blow out of the southeast. These winds would result in incrased deposition of ash on the northwest side of the cone during eruption, and greater erosion on the southeast after eruption. 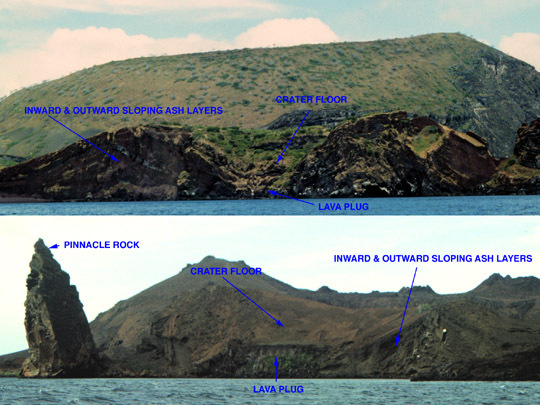 Classic examples of tuff cones are found around James and Sullivan bays and Buccaneer Cove, Santiago, and around Pinnacle Rock, on Bartolomé. A small tuff cone at Buccaneer Cove and the cone that formed Pinnacle Rock have been eroded to reveal a cross-section of their interior.